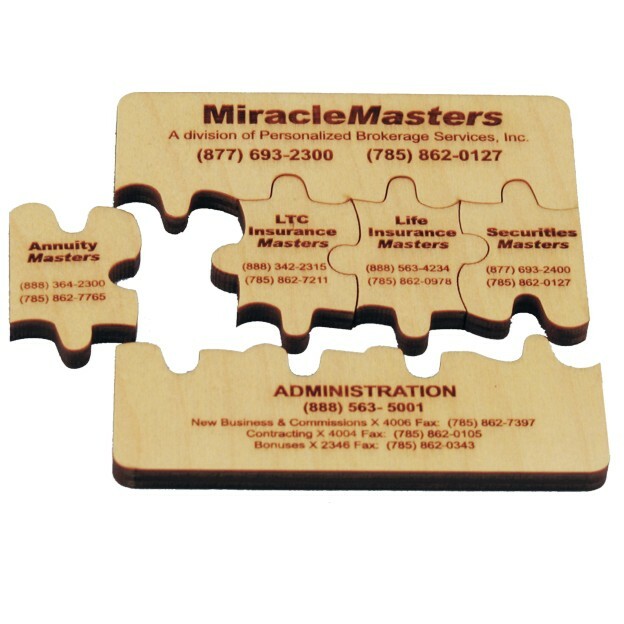 Laser engrave or 4-color process print your message or logo onto the fully interlocking wood birch puzzle pieces. These ply puzzles come in two sizes (see also 1307-45) and you select how many puzzle pieces you want cut (4, 6, 8, 9, 12 or 16 pieces for this size). These puzzles are excellent tools for team building, communicating organizational missions, philosophies, goals and objectives and delivering inspirational messages. Do you want the puzzle pieces cut in custom shapes? This upgrade is also available. The unassembled puzzle will arrive in a black velveteen pouch. Let the fun begin! Consider lasering a photograph. You'll be amazed at the detail of the engraving of this upgrade option. For a knock your socks off effect, use fluorescent acrylic instead of the birch ply; it will definitely set your promotion apart. 6 1/2 x 7 x 1/4"
Price includes laser engraving or 4-color process printing and black velveteen pouch. Laser area: 6 x 6 1/2"